What’s not to love about food in mini-form? Variety abounds when you can indulge in not one but two or more of a shrunken version of the classic burger. Z and I had a delicious time tasting different toppings and accompaniments, a few of which I highlight in this month’s Foxhollow Farm recipe. A blend of Foxhollow’s ground beef and ground chuck offers a clean and rich base and creates the perfect platform to showcase a plethora of flavors. My immediate thought was pimento cheese. It is one of my all-time favorite burger toppings and it’s addictive power speaks for itself. Bacon is also a sure-thing when it comes to burger accompaniments and I decided to push it over the edge with the addition of a fried egg, avocado and sriracha. Our final slider is a celebration of caprese season. A quick whirl of the food processor brings together a vibrant green pesto and slices of mozzarella gently melt into the warmth of the freshly grilled burger. A bright red tomato is the shining star on this balanced and seasonal burger. With grilling season well underway, now is the ideal time to hand-craft your own sliders. There’s really just one rule: always use good beef! 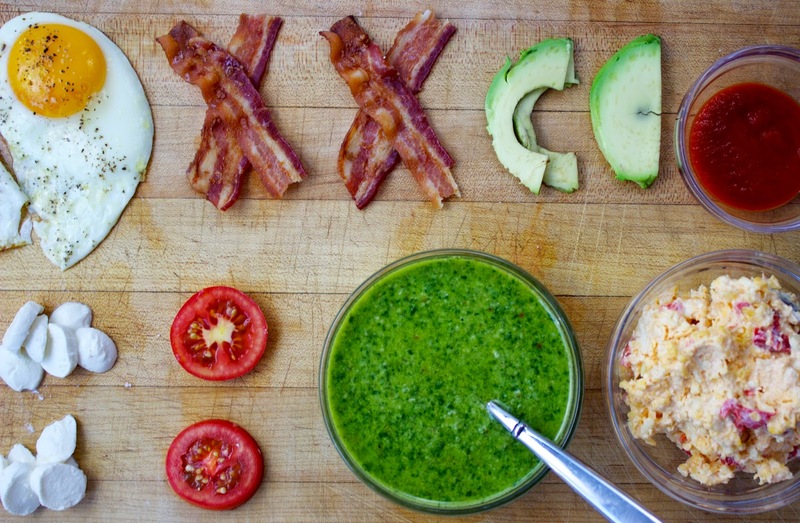 Start by making your pimento cheese and pesto. You can find my pimento cheese recipe here and I’ve added the step-by-step directions to the recipe recap at the end of this post. For the pesto, begin by putting the following in the bowl of a food-processor: two cloves garlic, one quarter tsp red pepper flakes, one third cup walnuts, one half tsp kosher salt, one quarter tsp freshly ground black pepper, and two cups fresh basil, firmly packed. Pulse until combined and chopped. Add the juice from one lemon and pulse to bring everything together. Next, with the blade running, slowly pour one cup of olive oil into the feed tube. Scrape down the sides of the bowl and stir to make sure everything is combined. Add one half cup freshly grated parmesan cheese and stir with a spoon. Taste for seasoning. Remove to a bowl and set aside. Time for the burgers! Preheat your oven to 375 degrees. Place your bacon on a rimmed cooking sheet and bake for 10-12 minutes until crisp (you will need one slice of bacon per slider). Remove from the oven and drain on a plate lined with a paper towel. Turn the heat down to 350. Combine one pound Foxhollow Farm ground beef and one pound Foxhollow Farm ground chuck with one tsp kosher salt, one half tsp freshly ground black pepper and one tbs Worcestershire sauce. 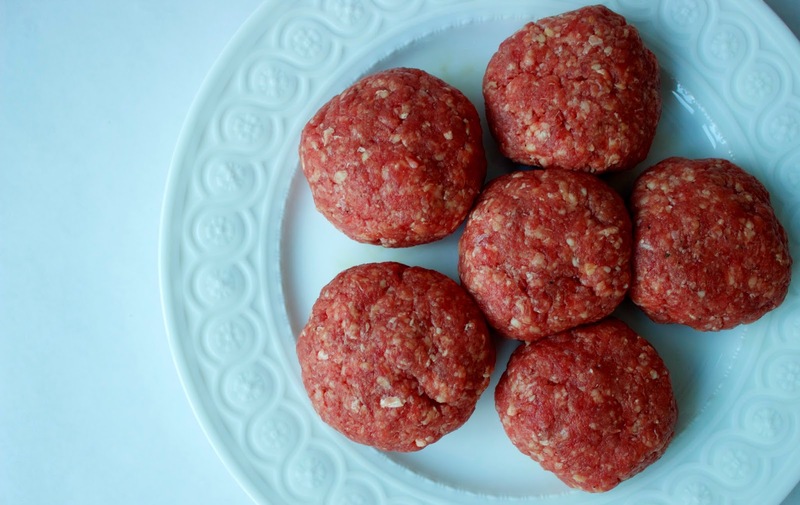 Form the meat into small patties, a bit larger than the size of a golf ball. Two pounds of meat will yield 12 sliders. Pre-heat a cast-iron skillet (or grill) to medium-high heat. Add one tbs olive oil and allow to warm until hot but not smoking. Cook the sliders for five minutes on the first side and then flip, cooking for an additional three to four minutes on the other side for medium. While the sliders are cooking, place the buns in the oven for five minutes so they are nice and toasted. Fry two eggs, sunny-side up, until the whites are set and the yolk is still runny. Trim off the edges to make each egg slider-sized. Remove the sliders from the pan and allow to rest, tented with tinfoil. Assemble each slider and serve. Enjoy! Place the following in the bowl of a food-processor: two cloves garlic, one quarter tsp red pepper flakes, one third cup walnuts, one half tsp kosher salt, one quarter tsp freshly ground black pepper, and two cups fresh basil, firmly packed. Pulse until combined and chopped. Add the juice from one lemon and pulse to bring everything together. Next, with the blade running, slowly pour one cup of olive oil into the feed tube. Scrape down the sides of the bowl and stir to make sure everything is combined. Add one half cup freshly grated parmesan cheese and stir with a spoon. Taste for seasoning. Remove to a bowl and set aside. Preheat your oven to 375 degrees. Place your bacon on a rimmed cooking sheet and bake for 10-12 minutes until crisp (you will need one slice of bacon per slider). Remove from the oven and drain on a plate lined with a paper towel. Turn the heat down to 350.